This document presents the first step in formal regional marine planning in the Clyde. Addressing the requirements of the Marine (Scotland) Act 2010, it presents a comprehensive review of environmental, social and economic trends and issues at the Clyde Marine Region level. This provides the baseline for the development of policies within the Regional Marine Plan, and against which to measure progress. What is the current status of the environment in the Clyde; what are the primary issues of concern? As part of an Ecosystem-Based Approach (EBA), how can ecosystem services be applied at a regional level? What are the key knowledge and data gaps in relation to understanding the condition of the Clyde marine region? 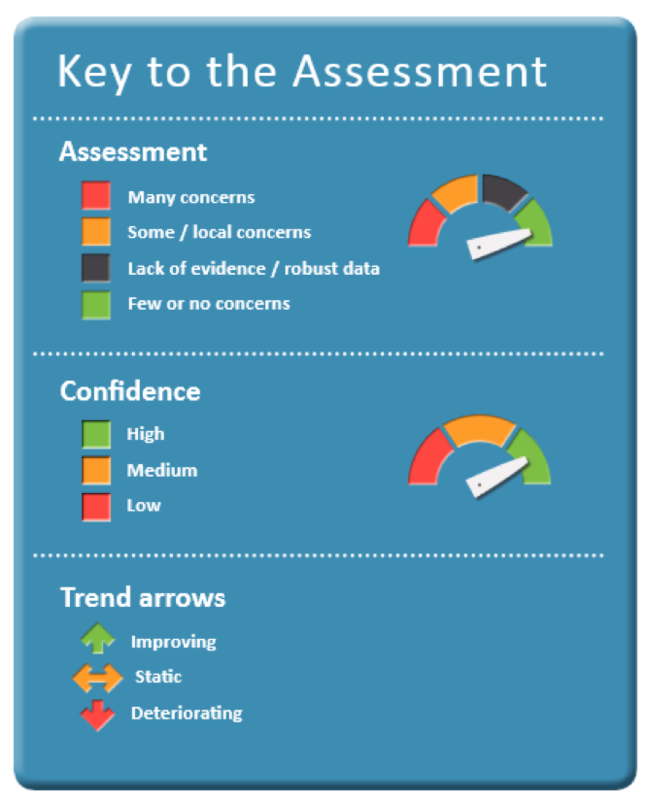 The report presents the results of an assessment of the condition of the Clyde Marine Region, documenting a summary of the significant pressures and the impact of human activity. It provides a more detailed analysis at regional level of the broad assessment undertaken through the development of Scotland’s Marine Atlas, an assessment of Scotland’s seas, which informed the first draft of Scotland’s National Marine Plan. It was informed by the guidance document: “Initial principles for developing assessments to support Scottish Regional Marine Plans”. Structured around Scotland’s Vision for the Marine Environment (“‘clean, healthy, safe, productive, biologically diverse marine and coastal environments, managed to meet the long-term needs of people and nature”), the report presents an assessment of the current condition of the Clyde Marine Region, based on available data. Each aspect is presented in terms of a trend, either ‘Improving’, ‘Static’ or ‘Deteriorating’, and with ‘Many concerns’, ‘Some / local concerns’, ‘Lack of evidence / robust data’ or ‘Few or no concerns’. Acknowledging the limited quality / lack of data in some cases, it includes indication of the confidence (High, Medium or Low) in the data informing the assessment, and relates this to identification of key research and knowledge gaps. The CMPP also aimed to incorporate an Ecosystem-Based Approach (EBA) by relating the assessment of the region to relevant ecosystem services where possible. established confidence levels regarding various marine and coastal pressures and uses that have potential impacts on the marine and coastal environment. provided information of research gaps and knowledge to be addressed in the future. economic contribution, pressures and impacts. The Clyde Marine Planning Partnership will now work to develop policies within the Regional Marine Plan to address these issues. 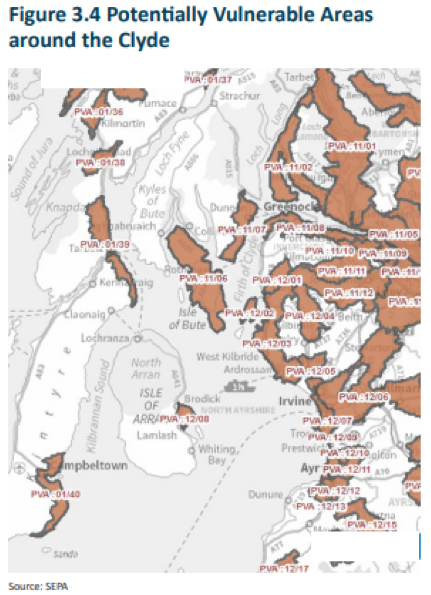 Identified potentially vulnerable areas using the IPCC emissions scenarios to predict sea level rise and flooding (this was done through the 2017 sea level rise and storm surges in the Firth of Clyde). This output compiled results of various studies on the health of the marine environment and its biological effects to produce an overall assessment of the condition of the regions marine, coastal and river basins, developed in line with the EU WFD which was transposed into the Scottish law as the water environment and water services (Scotland) act 2003 (WEWS), the Clean Safe Seas Environmental Monitoring Programme (CSEMP), etc. Sediments and metals concentration and the biological effects of hazardous substances on living marine organisms were also present in the marine waters. For instance, the enzyme 7_Ethoxyresorugin-O-deethylase (EROD) concentration in male fish livers across same species were all above Background Assessment Concentrations (BAC) at all sites. There are no Nitrate vulnerable zones in the region, whereas water bodies saw improvements from high unknown pressures affecting phytoplankton to a good status. Shallow coastal areas of depths less than 40m have a much greater abundance of marine litter found in bays, which are more sheltered. This is reflected in the Clyde Marine Region (CMR) where, due to the prevailing south westerly winds, litter congregation areas or ‘sinks’ are found in sheltered areas at the top of the Clyde sea lochs and also northern shores, especially at Helensburgh. The Regional Assessment focusses specifically on the environment and issues of the Clyde Marine Region, however, as the first region to finalize the assessment process under the requirements for marine planning in Scotland, the methods developed and used to undertake the assessment provide important experience for other Scottish Marine Regions. More broadly, it is relevant in considering how we assess ‘baselines’ including reflections on the quality of data and how assessments of condition are made that appropriately acknowledge this. Scottish Government plus other sources, costs not known.